Being one of the leading service providers, we offer our customers Marble Floor Inlay Cutting services. Use of latest technology and machinery assists our team to provide the customers with accurate results. Our professionals are expert in this industry and are capable of cutting the marbles in different complicated shapes, which are specified by our clients. Also, our professionals follow international quality standards so as to meet the cutting specifications. We are one of eminent companies engaged in providing services of CNC Water Jet Cutting Machines. We offer job works in this field and specialize in cutting different types of materials ranging from soft items like foam to hard metals, titanium and granite. Our water jet cutting machine implements a versatile technology that is specially meant for cutting different types of materials. We incorporate latest technology, which helps us cut materials into various sizes, shapes and designs. 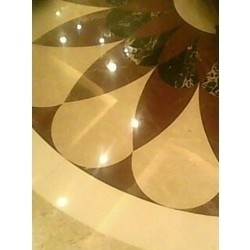 Our marble inlay works, marble border and marble designs are highly appreciated in the industry. Our technology does not result in discoloring, metallurgical changes, warpage and slag. This technology also helps us reduce the costs by eliminating the requirement for secondary finishing, due its features like high edge quality, heat dissipation, minimal burring associated with water jets, no doss or slag to grind off. We offer our products through our team of experts who work efficiently towards providing high quality and prompt customer service.